As promised a few weeks ago, I'm starting a series of posts to go into more detail about my newly-decorated (well, to be honest, it's more like CONTINUING-TO-BE-decorated because I still am collecting items for it) studio. When I moved my craft space downstairs, I decided it needed a theme. When perusing the internet for ideas, I fell in love with the many vintage / antique rooms I found. I had already picked up a few antiques, so I began visiting antique shops, thrift stores, and of course, eBay to outfit my space. 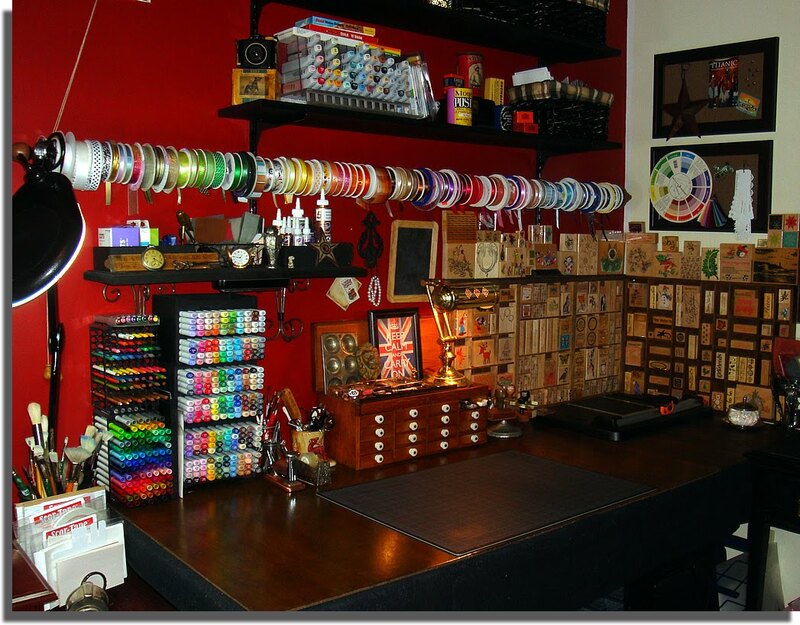 Today's post will highlight probably the most important part: my workspace. I placed my six foot table on the long wall opposite the door to the room. Over it I attached two vintage printers drawers that store my rubber wooden stamps. As in my old room, I ran a long curtain rod above those to keep my ribbon in view and at hand. 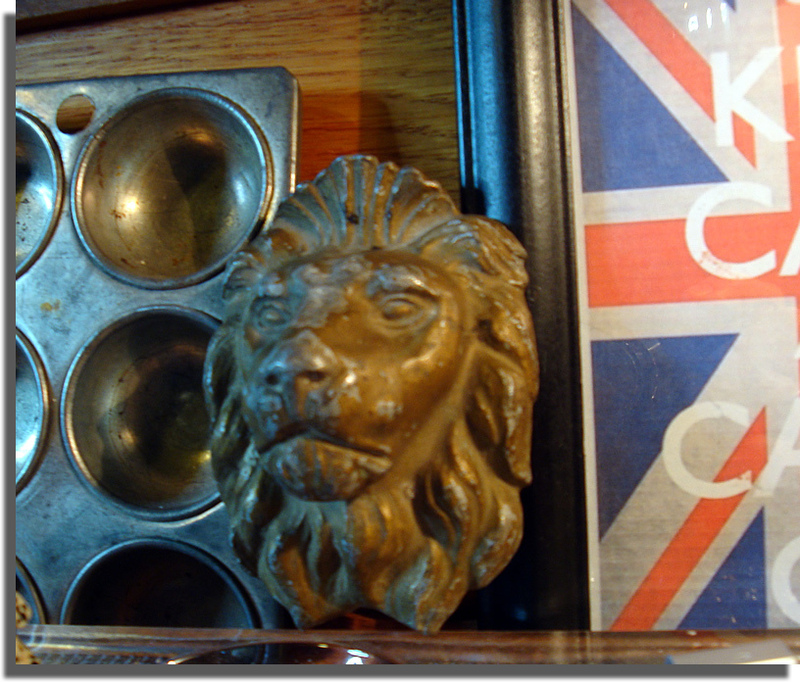 On top of the cabinet sits an antique glass pen and ink holder, an old tin tart tray (to hold shavings when sharpening pencils), a great heavy lion head - a recent find that I think may have been a furniture decoration. 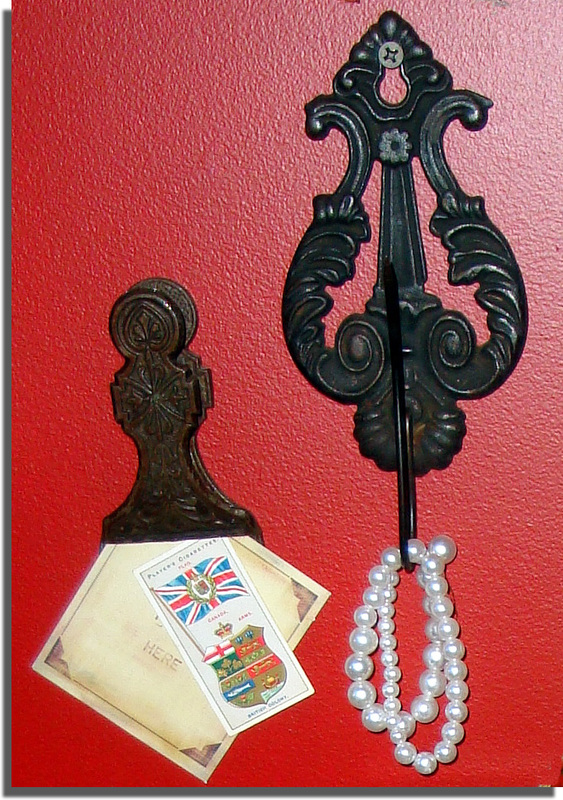 The other three antique pieces above the cabinet are two Victorian items: a cast iron metal clip and a cast iron note hook. The small card on the clip is from 1905; a Player's cigarette card from the UK all about "The Dominion of Canada" (depicting the Canadian crest and flag at the time). The chalkboard is a child's item from a local antique shop; they are very hard to find with real slate. As always, click on the images for larger views. 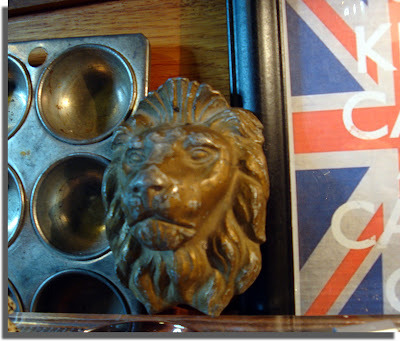 The next post will feature the other vintage items on my desk. This card features a dragonfly stamp from Michael Strong... I have a few of his beautiful "cloisonné" designs. 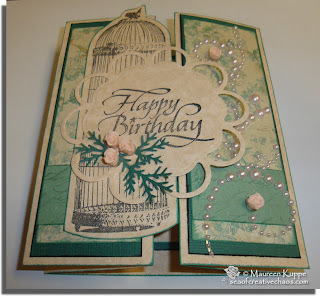 This one is stamped with Tim Holtz' Embossing pad and Tsukineko black embossing powder. I then coloured it in with Copics B14, RV10, V12 and YG11 and popped it up on foam dimensionals. The patterned paper is by "Me & My Big Ideas". 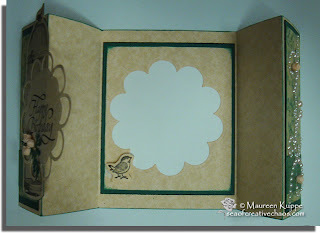 I used some Spellbinders dies for the circular sentiment and coloured border of the top layer with Copic V12. The same papers were used for the second card. 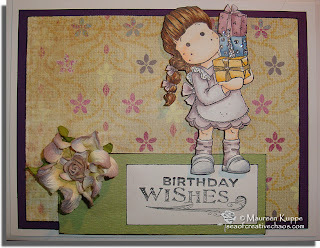 The sentiment stamp is from my stash; and it's not marked... The ribbon is also from my stash. I find it's faster to do a couple of cards at the same time - they may have some of the same supplies, but I make sure they have different designs. 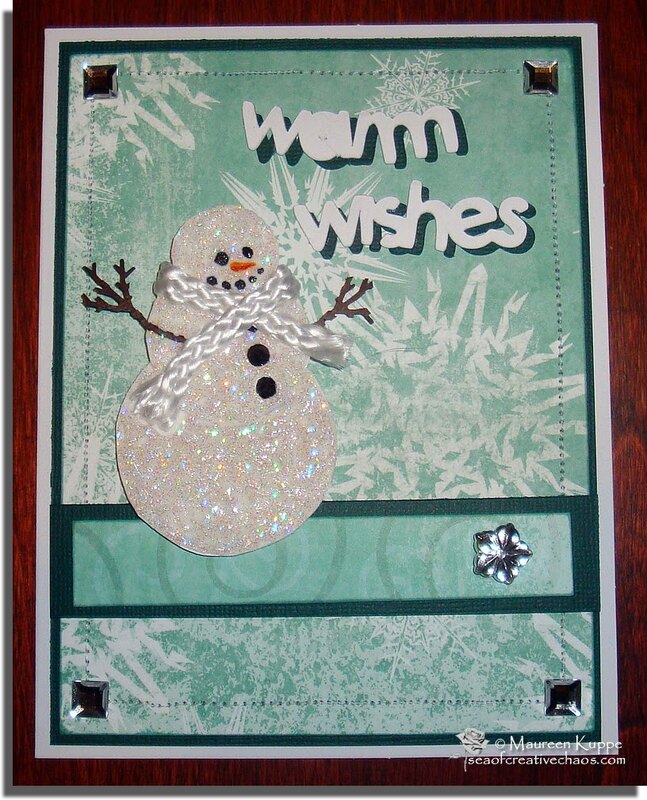 The stipulation for this one was that it had to include a snowman. 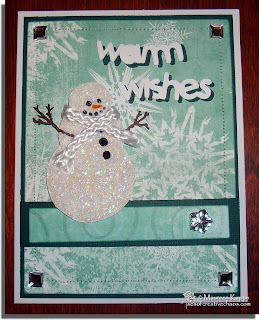 I created this guy from scratch - I used my Spellbinders dies and Cuttlebug to create three round shapes. I glued them together, added eyes and mouth "coal" using some black "Smooch" paint. The nose was painted with both yellow and red Smooch paint since I didn't have orange for the "carrot" nose. "Star Dust" Stickles were added to the snowman's body, and the stick arms were created using the Martha Stewart Pine Branch punch, cut down to size and shape. Some satin rope I saved from a shopping bag (I throw nothing out I think I can repurpose) was used as his scarf. The sentiment was cut on my Cricut using the Simply Charmed cartridge. A few clear gems added more bling over top the patterned paper from my stash, which was sewed onto cardstock. This card was created to meet the criteria of "use something new"; I got a gift certificate for a new local scrapbook store for Christmas - so I purchased (among other things) a new Martha Stewart Pine Needles Trim punch and two new Spellbinders die sets. Happy Spring Tilda was coloured with Copics E000, E01, C0, C3, YG11, YG13, YG17, E55, E57 and E59 and popped up using foam dimensionals. 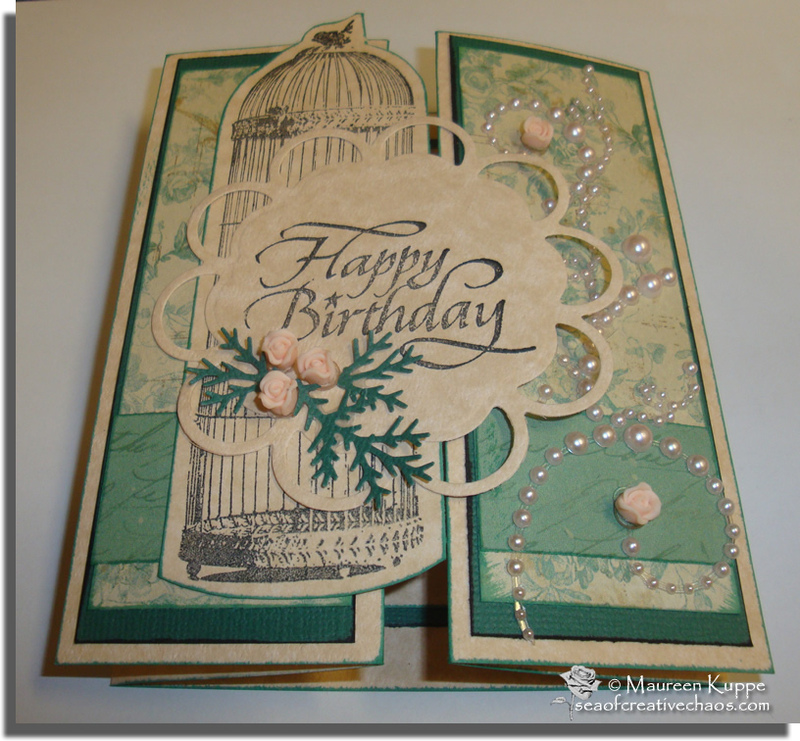 The background paper is DCWV Glitter Stack. 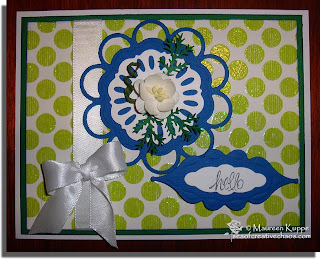 The card above was made for a "use two green and one blue" challenge. The background paper is from a 8" x 8" pad of "Me and My Big Ideas" paper. 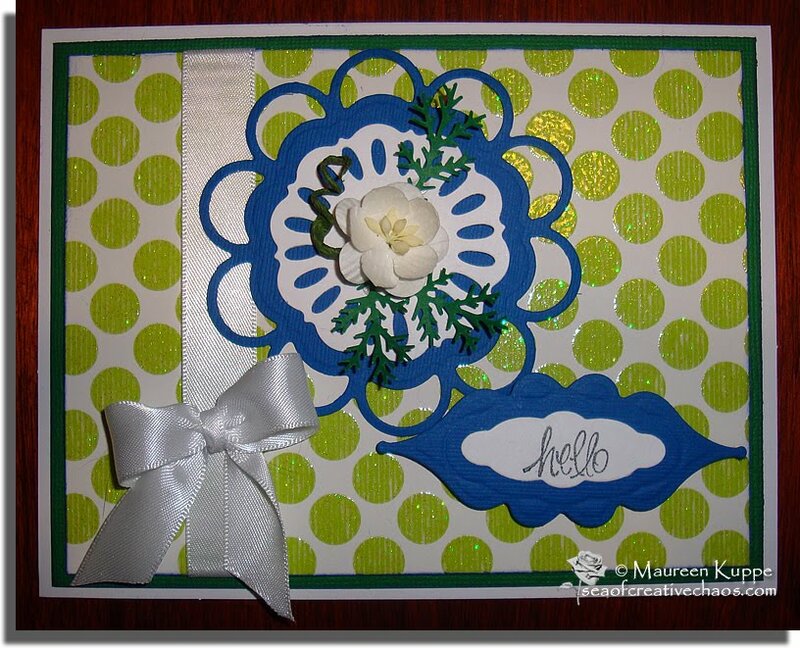 The blue shapes were cut using the Spellbinders Shapeabilities Blossum Tags and Accents dies on my Cuttlebug. A Wild Orchid Cherry Blossom was added along with Martha Stewart Pine Branches. The ribbon is from my stash as was the sentiment stamp. 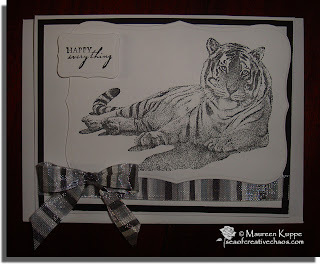 The last card I created for this swap is a Thank You card. I started out with the background paper; Bo Bunny's "Calypso Dream". 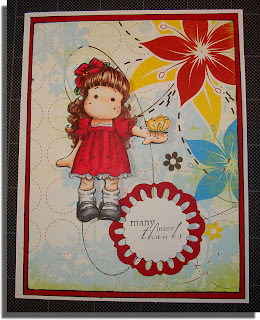 I used my new Spellbinder's Shapeabilities on this one too, creating the backing to the sentiment in red cardstock. Tilda With Hawaii Flower was coloured with the following Copics: E0000, E02, E11, E13, E21, E25, E27, E29, C3, C6, N1, N4, N9, R46, R89, Y17, Y21, G21, G28. I hope all the recipients like my cards! Some people may think Friday the Thirteenth is unlucky. This is what is called a "Z fold" card. 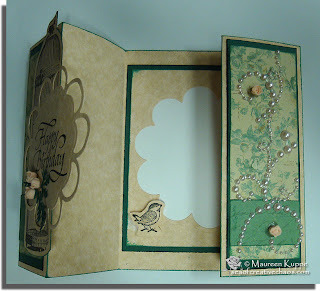 A single piece of 5.5" X 12" cardstock, scored four times makes the base. 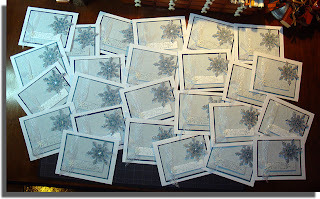 I chose some really pretty TPC Studios Ancestral Bird Brocade paper for the front mats. 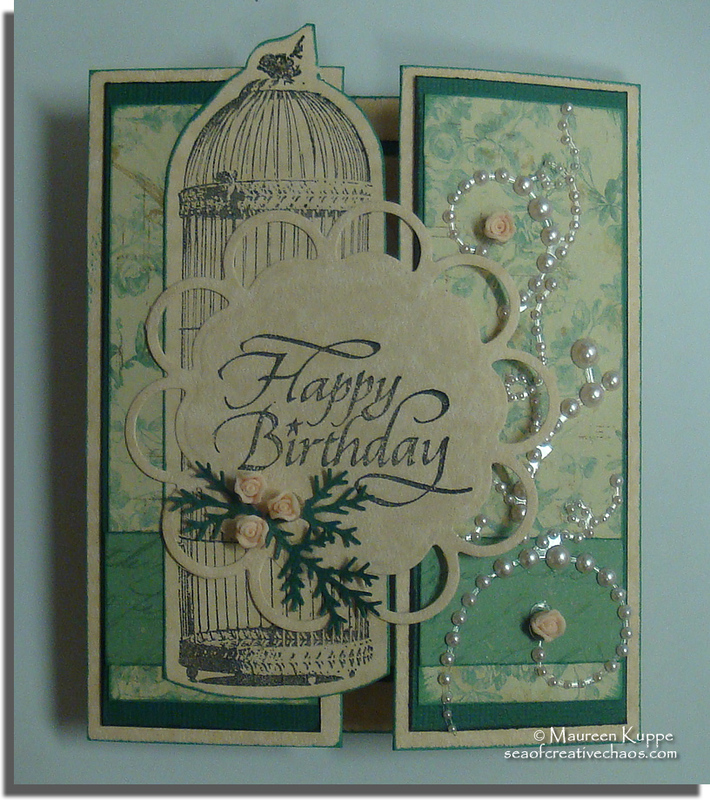 A new Kaisercraft Bird Cage stamp was added to the front left flap, and then using my new Spellbinders Shapeabilities die, cut the front sentiment overtop. 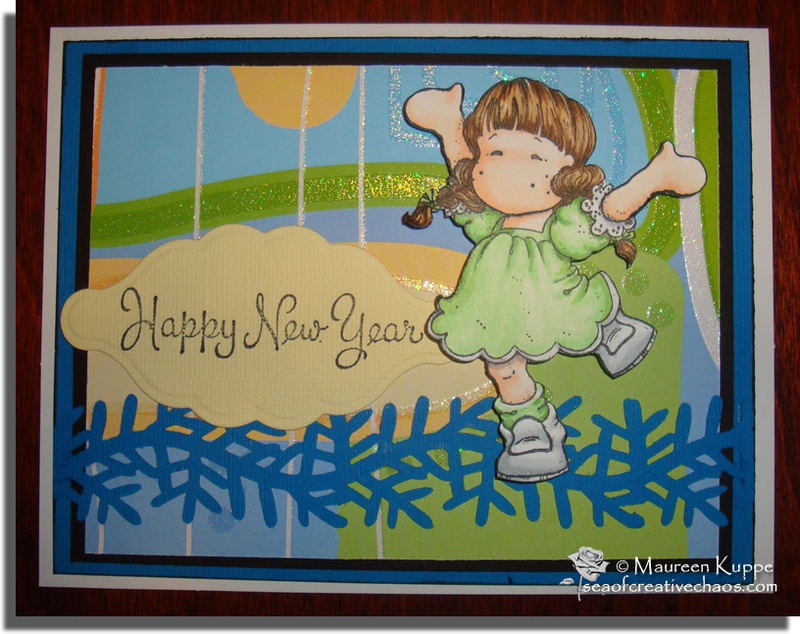 I used the "negative" or left over paper to decorate the inside of the card. 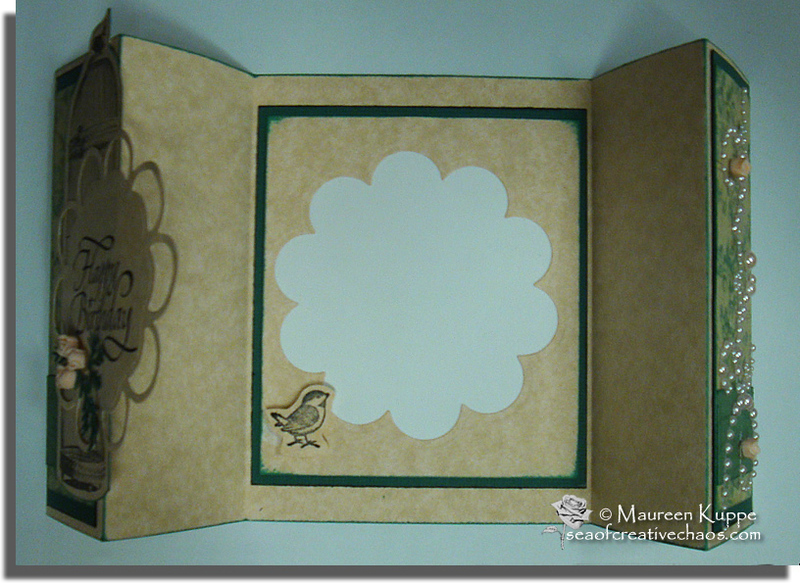 Both the sentiment and the small bird were created with Inkadinkado stamps. The right flap had Recollections Floral Embellishments added. A few of the same roses were added to the front sentiment, along with a some Martha Stewart pine branch punch outs. Tim Holtz and Memento inks were used on the edges of he papers. She loved it, and I loved the way this turned out. Must make more of these easy, but impressive folded cards! For the past few months, I've been redecorating my craft room in the basement. Ever since I moved all my stuff down here, I've been really enjoying the ability to create in a larger space with a TV all my own! 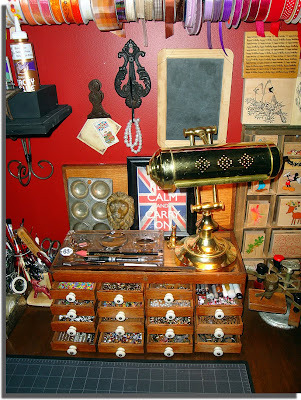 While researching craft rooms online for organizational ideas, I fell in love with the many vintage / antique styled rooms. So, here finally are some images of how mine looks so far with the pieces I've acquired since the Fall. Whew! Now that the stress fun of the holidays is over, I finally have time to post again! Since my last post (yeah, I know, MONTHS back), I have made a few cards I wanted to share. 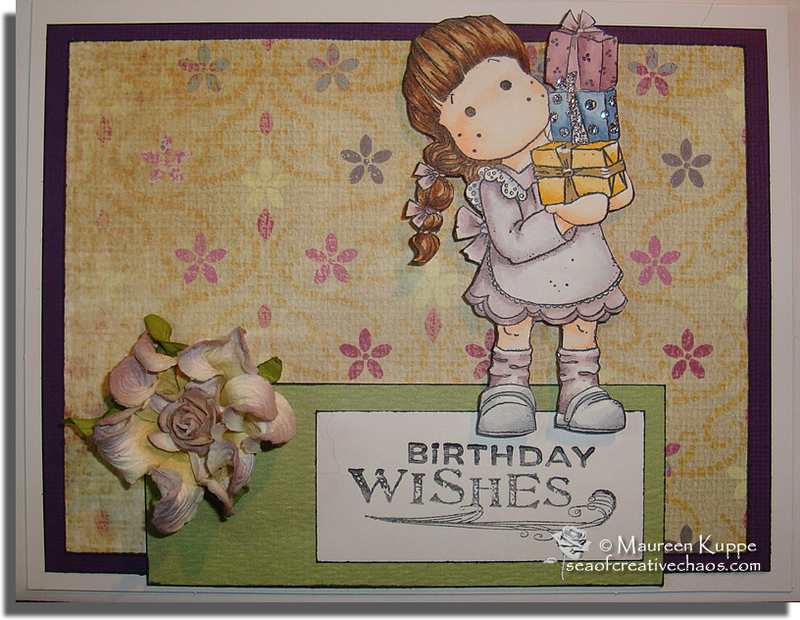 This card features Magnolia's Tilda with Gifts over some patterned paper from my stash. The flower is from Michael's, and some silver Stickles were added to the presents. Copics used on Tilda were: E0000, E01, E55, D57, E59, V91, V93, V95, C0, C3, Y32, Y35, Y28, B91, B93, B95, RV91, RV93 and RV95. 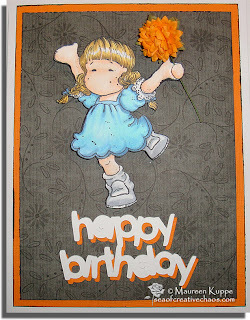 Happy Spring Tilda adorns this card on top of some Bo Bunny "Unforgettable" paper. 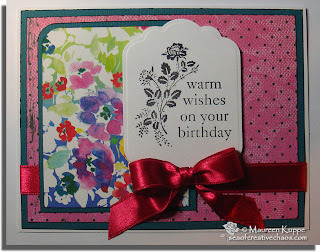 The sentiment was cut using my Cricut and the "Simply Charmed" cartridge. Copics used on Tilda were: E0000, E01, B0000, B32, B34, Y21, Y28, C0 and C3. The flower is from my stash... I cut a circular shape, coloured it in and glued it over Tilda's hand to make it look like she is holding the flower stem. Obvioulsy my favorite paper is the Bo Bunny line... here it is again. I used "Sophie Bouquet" on this card. 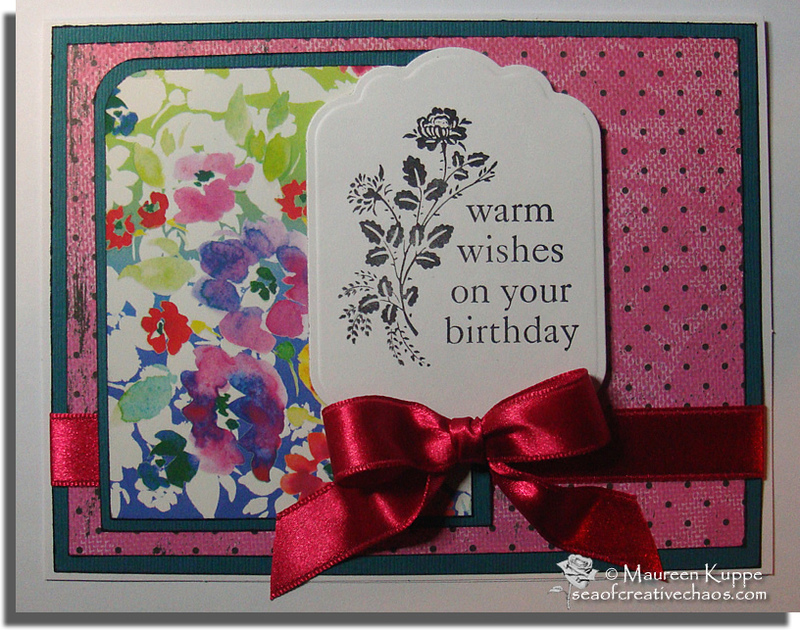 A few flowers from Michaels tied with a sheer ribbon were added along with a simple stamped sentiment. 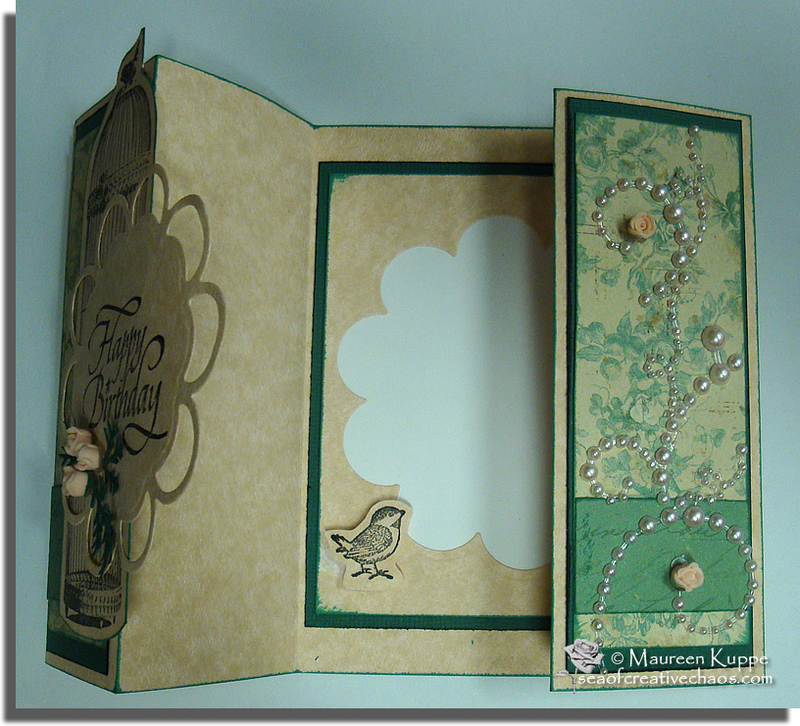 This card began with Fancy Pants' "Little Sprout" paper, # 310 "Baby's Breath". 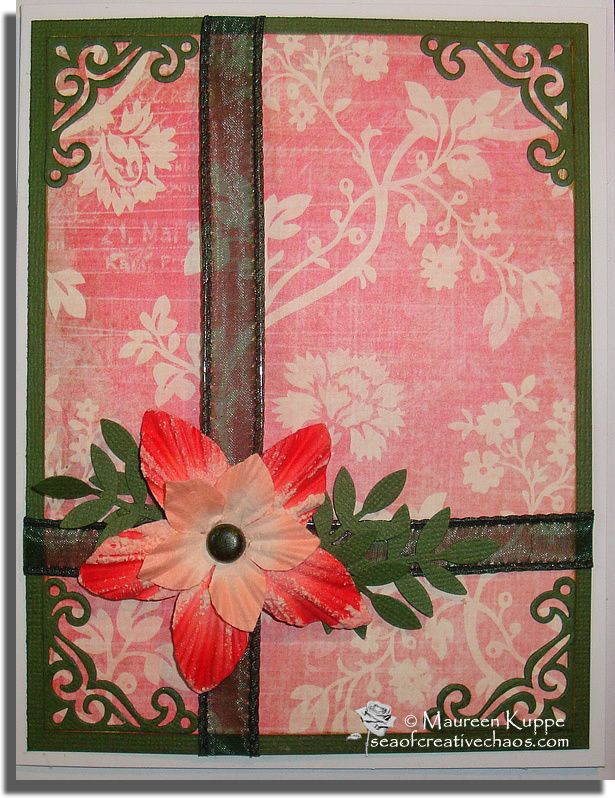 I used some Sheer Elegance hunter green ribbon, the Martha Stewart Leaves punch, a Provo Craft corner die cut on my Cuttlebug, some flowers from my stash with a brad coloured with Copic's G99 pen and some Tim Holtz "Peeled Paint" ink. Cards for guys are always harder to do it seems. 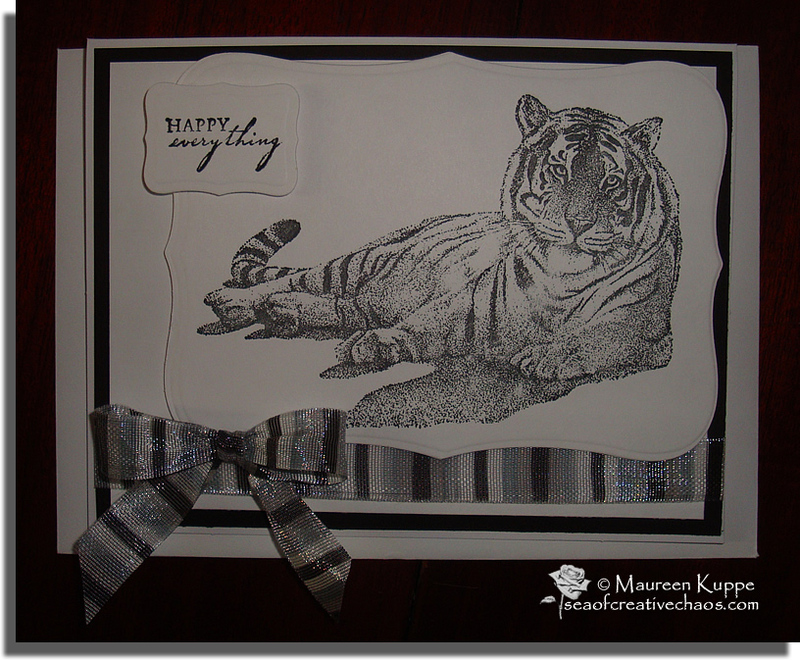 I decided to go black and white; and featured a tiger stamp a good friend gave me! 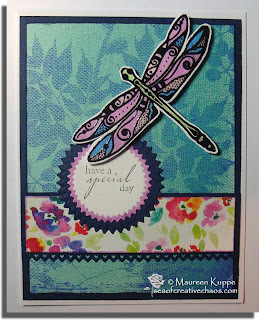 The ribbon is from my stash and the stamped image and sentiment are cut using my Spellbinders dies on my Cuttlebug. Good thing I have a Cricut... I made the snowflakes on it using my "Tie The Knot" cartridge (now, what a snowflake has do with weddings is beyond me....). 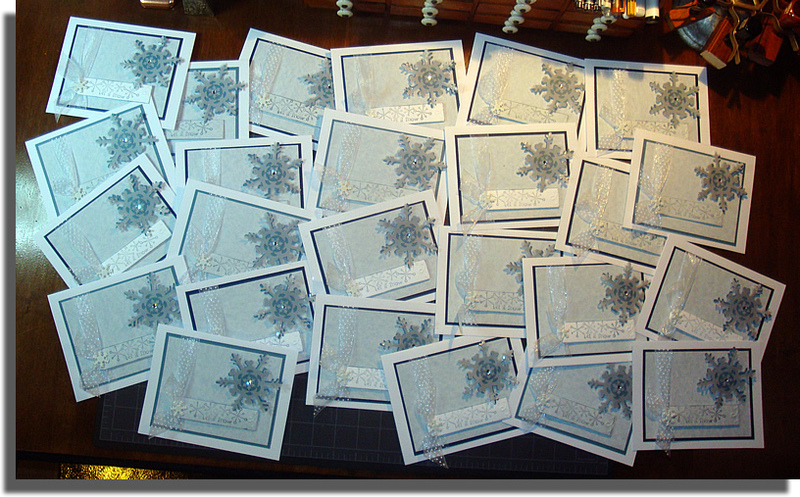 Both cardstock and vellum were cut, and stickles were added to the edges of the flakes. A clear gem was glued to the center of the flakes and snowflake brads attached the sentiment to the ribbon. 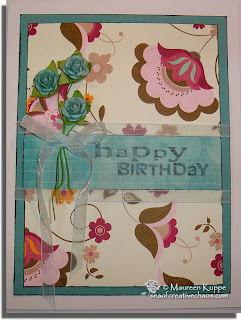 The paper and ribbon were from my stash, and I cut out the sentiment using my Cuttlebug. Whew! Here's hoping I get more time to both craft AND post about it in 2012. Just as a teaser though... there will be an upcoming post about my craftroom soon... since moving downstairs to a larger room, I have been decorating it and I am very eager to share some photos of the results!